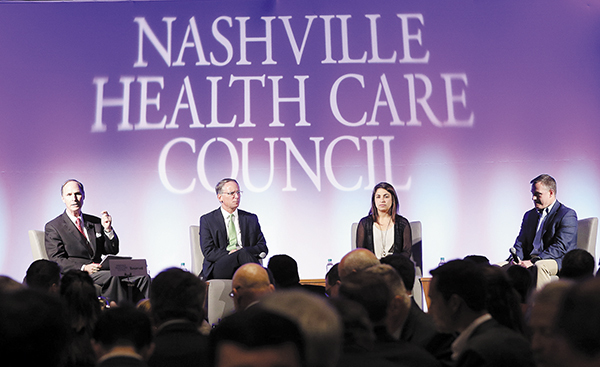 On May 22, more than 300 healthcare executives gathered to hear from top financial executives Matt Carroll, general partner of WestView Capital Partners; Anna Haghgooie, healthcare managing director of Sandbox Industries; and Paul Wallace, managing director of the Heritage Group, as part of the Nashville Health Care Council's signature "Financing the Deal" panel discussion. Tom Wylly, senior partner of Brentwood Capital Advisors, moderated the panel as industry financial experts gave insider perspectives on the state of the market, healthcare transactions and the outlook for funding Nashville's $84 billion healthcare industry growth. Despite overall deal activity being down in 2018, the panelists pointed out competition within the market has driven increasing multiples in sectors including healthcare technology, behavioral health, clinical supply, post-acute care, Medicare Advantage and companies helping providers shift from volume to value-based reimbursements. Panelists also mentioned the significant role consumerism has played in recent deal activity, noting the shift to high-deductible health plans and the increased public attention to healthcare costs. This transformation has created a desire for a consumer-friendly marketplace and additional opportunity for innovation. "I would advise early stage entrepreneurs to prioritize finding a customer over capital," said Wallace, a Nashville native. "Once you find the customer, capital will find you." There was a consensus by all panelists that collaboration is imperative when it comes to financing the deal. "You've got to develop a relationship with the strategic buyers," said Wylly. "There's a huge relational element." Panelists also referenced the increasing desire for collaboration among payers and providers. "Payers and providers want to have a different relationship with each other," said Haghgooie. "There is often a desire from the C-suite, but the barrier is in the existing infrastructure." Regardless of the complexities of today's industry, panelists said the challenges actually encourage increased innovation and entrepreneurship. "Because payment and reimbursement rules and methods are ever-changing, it presents continual challenges for providers," said Carroll, who has nearly 15 years of experience in the revenue cycle technology and services space. "As a result, it presents great opportunities for innovative companies to solve these challenges." Carroll added the city has the opportunity to take the lead when it comes to fostering technology innovation. "It would be a shame for Nashville to not be a hub of healthcare IT given the depth of knowledge where it really matters -- the provider space," he said. "Nashville needs to recruit and build tech talent and rally around its deep provider legacy. If it can do this, Nashville can be a real leader on the technology side of the industry." The city's collegial attitude toward helping the next generation of innovators is well known and attractive to those with capital. "There is such a great mentorship community here in Nashville helping young entrepreneurs create companies," said Haghgooie. "Here, entrepreneurs are able to surround themselves with people who've been there and done that, which shows a lot of credibility to investors." "As was expressed during today's event, Nashville has an incredible opportunity to come together to address issues facing the healthcare industry, particularly when it comes to healthcare IT," concluded Council President Hayley Hovious. "The Council looks forward to its role in bringing healthcare leaders together with innovative entrepreneurs in the technology space in order to meet these critical needs and to establish Nashville as the leader in healthcare IT."